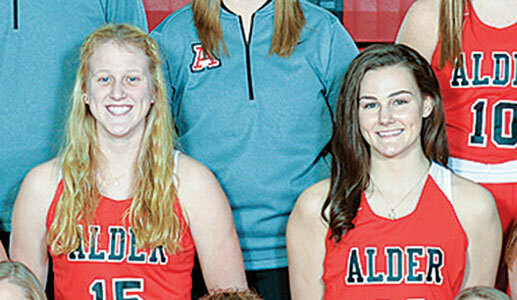 Corinne Parker, left, and Abby Jones were two of the five JA girls hoopsters who scored in double figures on Wednesday. The Lady Pioneers rolled to a 91-21 triumph at Graham. Sydney Bourquin scored 21 points and Abby Jones tossed in 20 on Wednesday as Jonathan Alder’s girls hoop squad crushed Graham, 91-21. They were joined in double figures by Melissa Walbom-15, Corinne Parker-11 and Sophie Zawodny-10 as the Lady Pioneers improved their record to 3-0. Alder, which will host Kenton Ridge on Saturday, jumped out to a 22-2 lead by the end of the first quarter. The game was well in hand for JA as it took a 45-6 lead on the Falcons’ home floor by halftime. The margin stretched to 74-11 by the end of the third quarter. Bourquin 8-5-21, Jones 7-4-20, Walbom 7-1-15, Parker 5-1-11, Zawodny 3-3-10, Wilson 2-1-5, Ferrito 2-0-4, Bushong 1-0-3, Jakse 1-0-2. Totals 36-15-91. Three-point goals: Jones 2, Zawodney-1, Bushong 1. King 2-0-5, Neeld 1-2-4, Cupps 1-2-4, Whaley 0-2-2, Shoemaker 0-2-2, Lawrence 0-1-1, Hinkle 0-1-1, Smith 0-1-1, Kemp 0-1-1. Totals 4-12-21.